The Binjai on the Park features 171 luxurious condominiums with the 50-acre KLCC Park right at its door step. The sprawling 19,200 sq ft of four-level super penthouse with an unobstructed full-length view of the Petronas Twin Towers can easily vie for the title of the “Most Exclusive Residence in Kuala Lumpur” if there is such an award up for take. 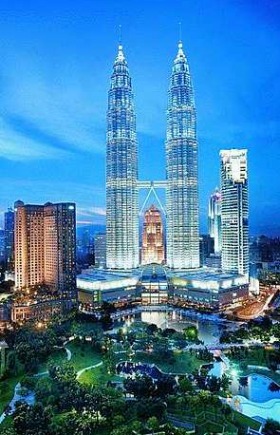 The spectacular vista of the world’s most touted and tallest twin towers is indeed a sight to behold. To enjoy this exclusive privilege atop the 45th floor of Binjai Barat (Tower A) of the luxurious condominium homestead of The Binjai on the Park project, the buyer has to be someone in the super rich list who will not bat an eye to sign over RM50mil. Yes, a cool RM50mil in exchange for the super penthouse, nothing less. For that price, the lucky owner will get to enjoy a host of privileges besides the 24 hours, seven days a week of unsurpassed view of Kuala Lumpur’s most recognised architecture landmark and a 360 degree view of the city’s skyline. Layar Intan Sdn Bhd, which is developing the project, is a wholly-owned unit of KLCC (Holdings) Sdn Bhd. Har further points out that the luxurious residence is the crowning glory of the exclusive condominium project which is the only residential project within the whole of the 100-acre Kuala Lumpur City Centre (KLCC) development. It is also the only one of two super penthouses that is still available for sale. The other slightly smaller three-level super penthouse with built-up of 14,000 sq ft in Binjai Timur (Tower B) was sold two years ago for RM38mil. The buyer is a prominent business tycoon who is on Forbes’ list of billionaires. The owners of these super penthouses will get to enjoy a private 24-metre infinity swimming pool and their own private lift. Har says despite its RM50mil price tag, the residence will be sold as a “shell and core”. “We have established that the buyer of such an exclusive home will want the flexibility to design their own home. The uniqueness of the super penthouse is the unfurnished layout, allowing the proud owner an opportunity to use their creativity in designing and ID fitting their dream home to their own taste and preference,” she explains. Designed by renowned architecture firm Architects Allen Jack + Cottier, The Binjai on the Park comprises a total of 171 residences on two 44-and 45-storey blocks. The units range from three-bedroom units of 2,200 sq ft to 3,700 sq ft, penthouses of 5,600 sq ft to 7,300 sq ft, and a super penthouse on each of the towers. According to Har, the project is developed based on the built-then-sell model, and since its completion in February last year, 70% of the units have been sold. The average price per sq ft (psf) fetched is about RM2,600. All the 100 residences in the 44-storey block or Tower B have been sold. 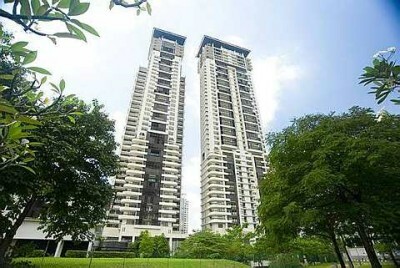 Besides the super penthouse, two duplex penthouses of 7,300 sq ft each priced at RM23mil are still available in Tower A. Also available are a number of standard units in Tower A priced from RM9mil to RM10.6mil. Har says it is the exclusive factor that makes the project such a hit among the well-heeled owners. RM50mil view. The owner of the RM50mil super penthouse in The Binjai on the Park gets to enjoy this scenery and a 360 degree view of the KL city skyline, among other benefits. For Tower A, there are only two units per floor with three high speed lifts opening up to the owner’s own private lobby via the personal security access card. Tower B has three residences per floor serviced by four lifts. She says the design of the residences will definitely meet the requirement of the high profile owners – a well-planned layout separating the entertaining area and the owner’s private living area. So far, there have been a number of interested potential buyers and discussion is still ongoing for the unsold units. One of the strong attractions of the project is that it is anchored on the lush 50-acre KLCC Park which provides residents a direct access to the park - home to over 1,900 indigenous trees that have been transplanted from their former sites to retain the sanctity of the city’s gazetted green lung. “This signature landmark of the KLCC masterplan provides more than 20 million sq ft of commercial, retail, hotel, residential, convention and entertainment facilities. “The availability of a plethora of prominent entertainment hubs, food and lifestyle outlets, shopping amenities, commercial, business and health facilities, all within a stone’s throw of the development, underpin the development’s uniqueness and appeal,” Har points out. She says the target buyers are highly discerning buyers who appreciate the quality of the product and location, and are exposed to iconic real estate development in the likes of the Hyde Park in London or Central Park in New York. “From private catering to getting those hard-to-come-by Philharmonic tickets at Suria KLCC, our hospitality-trained concierge provides a host of personalised services. Living at The Binjai on the Park is no different from the attentive level of lifestyle one gets living in upscale Manhattan or central London,” she adds. She says most of the foreign buyers are buying the property as part of their “trophy collections” to be used as one of their many holiday homes in various global cities. The upscale project has so far attracted buyers from Hong Kong, the UK, Singapore, China, New Zealand, Taiwan, Dubai and Japan. Shum (left) and senior sales manager Daniel Tan with a model of the three-storey Garden and Duplex Suites of The Seed @ Sutera Utama. Buying a property at The Seed @ Sutera Utama in Johor Baru is similar to taking an oath of allegiance to take care of the environment for the present and future generations. The first question that the developer will ask its prospective buyers is whether they are willing and ready to be part of the community by contributing their efforts and time to protect the environment. “If the answer is yes, they proceed to the signing of the sales and purchase agreement, if not they (buyers) can look for other properties,’’ Tanah Sutera Development Sdn Bhd general manager Steven Shum says in an interview with StarBizWeek. He says the company is not being “selective or arrogant” but is committed to a clean and green neighbourhood and wants to offer more than just houses to its buyers. Shum says the company is probably the first in Johor or even Malaysia to ask such question to its potential buyers. He also claims many of the buyers do not feel offended and those who bought the properties are looking forward to be part of the “green community” when the project fully developed in 2015. The project with a gross development value of RM700mil is located within a gated 19.02ha encompassing 1,230 units of residential properties ranging from penthouses to garden suites namely the three-storey Garden and Duplex Suites, six-storey Boutique Suites and nine-storey Boutique Suites with floor area ranging from 1,240 sq ft to 2,390sq ft and priced between RM558,000 and RM1.1mil. Tanah Sutera Development Sdn Bhd is a consortium of Malaysian and Singapore-based companies namely Permodalan Nasional Bhd, Lembaga Tabung Angkatan Tentera, CapitaLand, Keppel Land and Lee Rubber Co (Pte) Ltd.
“We don’t only preach on green-related issues to our buyers but we also practice the green building initiatives in the construction of the houses,’’ Shum says. The green initiatives include using pre-mixed reinforced concrete with the effective micro-organisms (EM) glass panels to allow sunlight in and harvesting rainwater to water and clean the gardens. Shum says it is proven in Japan that by mixing concrete with the EM, the concrete become water-repellent and thus prevents sick-building syndrome which is common in Malaysia. Similarly, he says each household is expected to play their part as the “green community” by separating rubbish such as plastic, glass, paper into their respective bins. Shum adds each family will be provided with a container for them to discard their food waste to make compost and the compost will be used as fertiliser for the communal gardens within the projects. “We want to bring back the communal living or the kampong spirit in the good old days where everyone basically knows his neighbours,’’ he says. Shum says this can be achieved via activities organised such as get-together parties for residents in celebrating festivals, birthdays or weddings. He says as for the communal garden, each block will have its own piece of land where residents can set-up a garden committee to plant vegetables or fruit trees on the plot. Shum says residents have their own freedom in managing their communal gardens but must adhere to organic farming by not using chemical ferlitisers and use rainwater to water the plants. He says residents can harvest and share the vegetables or fruits among themselves or exchange them with residents of other blocks or may be, they can set ad-hoc make shift stalls to sell the produce. “Living in a gated and guarded community does not mean that ones have to mind their own business for the sake of privacy; our objective is promote esprit de corps,’’ says Shum. There are a number of measures that can be put in place to ensure the local property market continues to be healthy, sustainable and does not succumb easily to any adversities. It was just barely three years ago that we witnessed the widespread contagion effect of the collapse of Lehman Brothers on the world economy. The external front is still shaky and there is a strong likelihood that a second and more severe financial crisis, or “double dip” may happen. With a growing number of European countries going into debt crisis, the next big trigger may come in the form of a debt default by the US following its ballooning deficit. To avert a potential meltdown from the frail external economic conditions, it is important to build a strong foundation for the local market. There are potential hazards lurking that may cause the market to lose substantial value if we are not careful. Among the potential hazards include over-speculation and over-commitment to household loans that may lead to disability to service the loan, and result in higher incidence of non-performing loans. Bank Negara is closely monitoring the market for signs of overheating and a potential policy tightening may be in the offing. The central bank is reportedly looking at modifying the mode of calculation for household loan (that covers mortgage and hire purchase) from gross pay to net pay. If the measure is implemented, it will mean that borrowers will only be eligible for a lower loan amount based on a percentage (usually up to a third for housing loan repayment) of their take-home pay after deducting payment of income tax, and contribution to the Employees Provident Fund and Socso. The measure should be welcome as it will curb over-commitment in household loan and ensure there is enough left for other household expenses. Over the past two years or so, many Malaysians have joined in the rush to buy property as the market has been overflowing with cash, and property is the biggest beneficiary of this high liquidity in the system. I believe one of the main reasons for the sharp and rapid appreciation in property prices can be attributed to the fact that there are very few alternative investment options around for investors. To “dilute” the high appetite for property, it is necessary to open up other viable investment options so that those with surplus cash can have other alternatives to turn to. In fact investment in unit trust has become quite popular as it actually fit the needs of those with lower risk appetite and do not like the volatility of the stock market. Raising savings interest rates will also be a good measure as it will attract more people to park their money in the banks again. With more people saving with the banks, financial institutions will have more funds to lend to corporate borrowers who need funding to expand their businesses. New start-ups and small and medium-sized enterprises (SMEs) are among the critical groups which need a helping hand from the banks to provide loans for working capital and expansion plans. There have been feedback from some smaller enterprises of the increasing difficulty in seeking loans from banks. Instead of just lending to mega corporations, banks should also pay attention to the smaller outfits as most of the big and successful firms today started out small once. Of course the normal due diligence and screening of the borrowers to access their credit worthiness has to be undertaken to avoid unnecessary problems later. These enterprises should not be underestimated as they will be able to act as a “cushion” should there be another economic or financial crunch. From the previous meltdown, we have witnessed how fragile the financial and investment markets can be. Although the property market is generally quite benign and not as volatile as the financial markets, the sharp hike in prices over the past two years have started to cause alarm in some quarters that the market is overheating. Although the sharp rise in prices is evident in certain places, notably the Klang Valley, Penang island and some parts of Johor, even some quiet markets like Ipoh and mainland Penang have also charted unusual price gains. It's true that many savvy investors have benefited from the sharp price appreciation of the past two years, but there are more people who have been affected by it. They are caught in a rather difficult situation of having to fork out at least a 20% to 30% increase in property price and higher downpayment for their purchases. Whether one is a potential buyer or seller, tenant, land owner, developer, or from the governing authorities, we are all stakeholders in the market, and should lend our support to ensure it remains stable and sustainable. Deputy news editor Angie Ng believes it pays to be prudent and not compromise on the sanctity of the market. PROPERTY consultants say the short-term outlook for the office market in the Klang Valley is soft, with supply outstripping demand, while the local retail sector continues to offer good prospects. A recent “Property Market Outlook” report for the second half of 2011 by consultancy CH Williams Talhar & Wong Sdn Bhd (WTW) says the office sector in the Klang Valley remains a tenant's market with a large amount of space available for leasing. The WTW report points out that landlords of newly-completed buildings continue to offer two to three months as rent-free periods to attract tenants. Recently constructed or refurbished office buildings are securing new leasings at a much slower rate while there are also office buildings along Jalan Tun Razak which have remained largely untenanted more than two years since their completion in 2008 and 2009. “In the first half of this year, purpose-built office space in KLCA (Kuala Lumpur Central Area) accounted for 40.1 million sq ft. About 5.975 million sq ft will be completed by the end of 2014, out of which, about four million sq ft in nine buildings will be located in the Golden Triangle,” says the WTW report. WTW managing director Foo Gee Jen adds that while there were no new developments completed in the first quarter of this year, over three million sq ft of new office space will come online by the end of 2011. Foo says the average occupancy in the Golden Triangle registered slightly below 90% in the first half, compared to 91%-93% in the last two years. Average rental and net yield of prime office space in KLCA registered at about RM6.50 per sq ft and 6.5% respectively as in the first half. HwangDBS Investment Management Bhd head of equities Gan Eng Peng concurred, saying that the supply of commercial properties is increasing more than demand. Gan adds that rental yields are falling, while vacancy rates and debt costs are rising. “Coupled with tighter regulations to curb speculation, the commercial property cycle has peaked. Drive around the usual Klang Valley hot spots such as KLCC, Solaris Dutamas, Solaris Mon't Kiara, Bangsar, Kota Damansara and Damansara Perdana you can see many unoccupied units,” says Gan. According to Gan, given the current sky-high prices, it is wiser to wait till the dust settles before investing in properties, especially business units. Although he points out that rental rates for KL Sentral office space has been quite stable, with prices increasing by only 4% to 5% compared with a year ago, property prices in the Klang Valley have gone up so high now that yields are in the low single digits. In the KL City Centre, new supply of commercial properties coming on stream in the near future include One @ Bukit Ceylon (a hotel suite by UOA Development Bhd), Binjai 8 (a service suite development by UOA Development due to be completed in January 2013 and priced around RM710 per sq ft), Summer Suites (an office block by Sunrise Bhd, priced at about RM700 per sq ft) and Sunway Velocity (an integrated residential and commercial development by Sunway City Bhd, at RM800 to RM900 per sq ft). In the KL Sentral area, there is Q Sentral (a grade A office tower comprising strata offices, developed by MRCB Land and priced at around RM1,200 per sq ft). SP Setia Bhd is also building its KL Eco City mixed development in the Bangsar area. Meanwhile, in the Kota Damansara vicinity, there is Surian Tower (an office tower development project by the Boustead Group) and Sunsuria Avenue developed by the Sunsuria Group which are available for leasing. Upcoming projects in the Kota Damansara vicinity include Sunway Nexis (an integrated commercial development by Sunway City Bhd, due to be completed in 2014 and priced at RM700-RM800 per sq ft) and The Cascades (a mixed development by Mitraland Group, due to be completed in 2014 and priced at RM650 per sq ft). Meanwhile, a recent report by Knight Frank Research says the Kuala Lumpur office market remained soft in the first half, with both rental and occupancy rates trending downwards due to the entry of newly completed office buildings in 2010 and early 2011. The Knight Frank Research report says the office market is expected to remain competitive given the abundance of incoming office supply scheduled for 2011. “Tenant-favoured market sentiment will continue to prevail and rental levels in general, may remain flat or decline slightly while the office take-up rate in existing buildings is expected to remain modest in the year ahead,” says the report. According to the WTW report, the retail sector continues to be resilient and vibrant with high occupancy levels in all the popular and established shopping malls. The report cited as an example, Viva Home, a retail centre along Jalan Loke Yew that was opened recently, which recorded a good take-up rate. “As at 1H2011, there were 120 retail centre developments in the Klang Valley totalling 40.45 million sq ft. Currently, there is virtually no significant new future retail space supply in the KLCA. Occupancy levels and rentals are expected to be maintained in 2H2011 as retail spending is expected to grow about 6% this year,” says the WTW report. Meanwhile, Knight Frank Research points out that the Malaysia Retailers Association has projected a lower growth rate of 6% in the retail industry for 2011 (2010: 8.4%) due to a continuous rise in the cost of living together with moderating growth in the world economy. The Knight Frank Research report says in 1H2011, rental rates for retail centres generally remained firm due to earlier existing leases locked in. It should be noted that with eight new shopping centres expected to be opened before the end of this year, the supply of retail space in the Klang Valley is expected to increase by 7% to about 42.9 million sq ft in 2H2011. PETALING JAYA: LBS Bina Group Bhd, well known for building affordable homes, will launch its maiden property project in Zhuhai, China, worth RM7.5 billion by mid-2012. Managing director Datuk Lim Hock San said the 79 hectare project will comprise high-rise and landed residences and a commercial complex, surrounded by a 120ha golf course. "We are almost firming up details for the project and hope to launch it next year, in line with our plans to be an international player," he said here yesterday at the launch of LBS' new image, identity and direction. The five-to-seven year project is a 60:40 joint venture with Jiuzhou Group, a Chinese government-linked company. The project was delayed by three years due to uncertainty in economic conditions. Lim said its overseas ventures will be one of the main contributors to group's earnings starting from 2013, led by the China project. LBS currently has 964ha of landbank in the Klang Valley, Batu Pahat, Cameron Highlands, Ipoh and China to keep it busy for 10-15 years. The land has the potential to generate some RM16 billion in gross development value. Its on-going projects, worth RM1.45 billion, include Bandar Putera Indah in Batu Pahat, Bandar Saujana Putra and D'Island Residence in Selangor, and Taman Royal Lily in Cameron Highlands. Meanwhile, as part of its new direction, LBS plans to build houses in the medium-high to high-end range to earn better profit margins. Spearheading its position in the high-end market is its flagship resort development called D'Island Residence, worth about RM3 billion. Sprawling over 70ha, D'Island Residence will offer 1,035 units of mixed housing, each worth RM1 million and above. 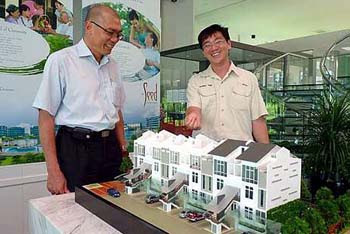 Lim said LBS will continue to build affordable houses priced below RM350,000, albeit on a smaller scale. This year, LBS is targeting sales of RM650 million, which is 54 per cent more than last year.